Cases involving child abuse are amongst the most difficult cases faced by courts dealing with Family Law matters. They are equally difficult – both from an emotional and evidentiary perspective for the parties involved. However, it is is irrefutable that abuse – either past abuse or future risk of abuse, carries severe consequences for a child. For this very reason, it is imperative that the law develops an approach to cater to the evidentiary difficulties involved in child abuse cases to ensure that children are free from abuse or risk of abuse. Abuse is not confined to physical or sexual abuse alone. It encompasses psychological abuse and serious neglect. This is made clear in section 4(1) of the Family Law Act 1975 (Cth) that provides a definition of abuse in relation to a child. 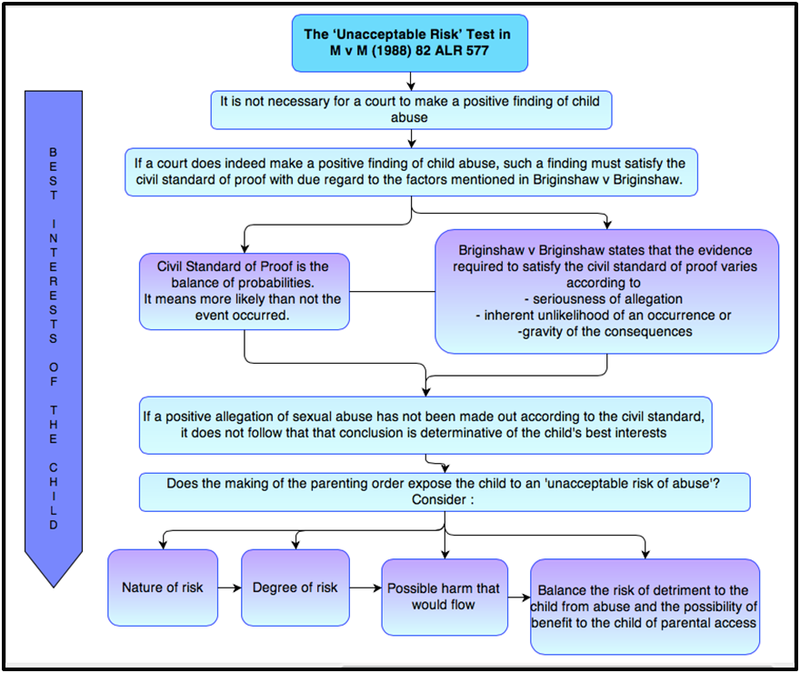 The High Court in M v M concluded that the test to be applied in making parenting orders is that ‘a court would not grant custody (now commonly termed residence or ‘lives with’) or access (now commonly termed contact) to a parent if that custody or access will expose the child to an unacceptable risk of sexual abuse.’ 5 The judgment helpfully provides the process in which this is to be determined. In fact, the High Court cautioned against courts doing so. The High Court rightfully emphasised that a family law matter involving children is to be conducted as a proceeding that is directed at the risk to the child, as opposed to a criminal trial of the alleged abuser. This standard is lower than the criminal standard of proof, which is beyond reasonable doubt. Balance of probabilities requires that it is more probable than not that the alleged event occurred. Briginshaw v Briginshaw is authority for the fact that the civil standard of proof (balance of probabilities) is not a fixed standard. The standard of proof has to cater to the seriousness of an allegation made, inherent unlikelihood of an occurrence of a given description, or the gravity of the consequences flowing from a particular finding. Depending on the nature of the allegation, the strength of the evidence required to meet the civil standard of proof may vary. The more serious the offence and gravity of the consequences, the more likely it is that the civil standard of proof cannot be satisfied by mere circumstantial or uncorroborated evidence. The fundamental issue remains the protection of the child from ‘unacceptable risk’ of abuse. ‘Risk’ of abuse essentially requires a court to assess possible future risk of abuse – hence it does not require a definitive finding that past abuse has in fact occurred. From the evidence available, a court is required to assess the magnitude, nature and the degree of risk of abuse and the harm that may result if the abuse does occur 12. The court then has to determine if the risk of abuse is ‘unacceptable’ such that it would justify denying access or custody to a parent. The test of unacceptable risk attempts to achieve a balance between the risk of detriment to the child from abuse and the possibility of benefit to the child of parental access. 13. However, the best interests of the child remain paramount. The advantage of the test of ‘unacceptable risk’ is that it caters to the nature and degree of the risk – hence it can adapt to the circumstances of a particular case and the type of evidence available. The test further concentrates on the welfare of the child, consistent with the requirements of the Family Law Act rather than determining whether the alleged abuser is in fact guilty of past abuse. 15. The main criticism directed at the test is that as it allows a court to consider unproven allegations of past abuse which in turn affect the assessment of future risk of abuse. This process is at odds with the traditional premise of legal reasoning. This type of legal reasoning ultimately provides a platform for false allegations of child abuse to be used to legally justify the removal of contact rights or parental responsibilities from one of the parents, usually the father. Many family law court litigants fear that unproven, unlikely and possibly irrational child abuse allegations can be used to justify cessation of contact with the victim parent’s children, not because of the veracity of the allegations, but because of their magnitude. ”It’s that grey area in the middle that you lose sleep over at night, and you do lose sleep,” 16. Furthermore, the test also offers little certainty in outcome. This is because it effectively requires an assessment of future risks and balancing of the risk of detriment to the child from abuse and the possibility of benefit to the child of parental access. The test certainly does cater to the requirement of section 60CA Family Law Act 1975 (Cth) that a child best interest is to remain the paramount consideration. What is required is further development on the principles emerging from the test in a way consistent with the judgment of the High Court and the best interest of the child. This would offer further guidance to lower courts and parties involved in understanding and applying the test. 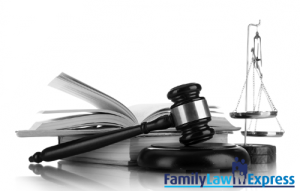 Do Parents Have Rights or Responsibilities in the Family Law Act? How do Psychologists view the Legal Definition of Family Violence? What is Family Violence according to the Family Courts? Should Children Be Interviewed for Family Reports? Hearsay – What is it and when can you use it? I am currently studying a Bachelor of Commerce (Accounting)/Laws degree at the University of Queensland. As my academic, professional and personal experiences have solidified my interest in commercial law, I am keen on pursuing a career in a commercial law firm that values excellence, diversity, and corporate citizenship.On a personal note, I am concerned by the diminishing access to the legal justice system facing our community, and wish to play a part in the efforts of ensuring that all Australians have equal access to the law to protect and enforce their legal rights.